4 Blank Greeting Cards - "Pretty in Pink"
Leslee Ortega uses color like no one else I've seen painting today. This sweet kitty takes my breath away. 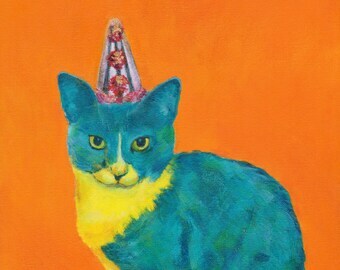 I love how she uses the blues against the vibrant red background. So pleased with this purchase and will be watching for my next chance to bring a Leslee Ortega original home. 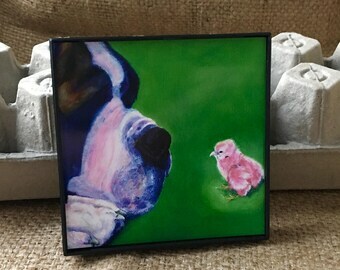 Her paintings make great gifts as well! AND she does notecards! Lovely card that shows the interaction between two different species checking each other out. Totally awesome class! So much fun! Painting on the street at the McKinney Art Studio Tour. It's such a joy to have Art be my world after working in sales, marketing and advertising in technology and software for many years. Every day is a delight in the studio! 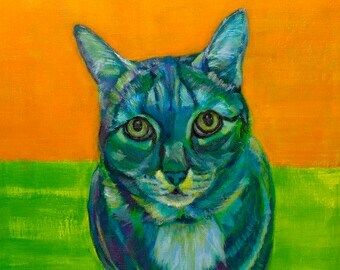 There I combine my love of form, color and painting in my work with contemporary pet and animal portraits, and increasingly other subjects. 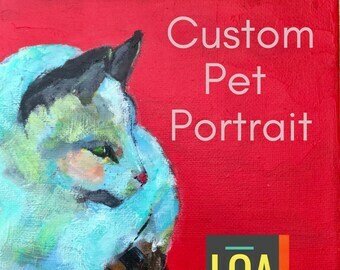 Pets and animals are a wonderful way to make meaningful connections with people as I explore and refine my artistic journey. One day I looked in the mirror and wondered when I'd get around to pursuing my true passion of becoming an artist and designer? Energized by this realization, I started studies at Mission Renaissance Fine Art Studio. This three year process provided me with a thorough grounding in fine art skills. I also took classes at the Interior Designer’s Institute + UCLA Extension. When an unexpected move from Southern California to McKinney, Texas happened in 2015, I earnestly began to pursue my goal of making art my business. McKinney is alive with artists and creative energy! I’m a Chamber of Commerce Member, involved with the McKinney Creative Community, The Art Club of McKinney, Jump into Art School, and the McKinney Art Studio Tour. I really enjoy sharing my creative talents with others through volunteer work at Dwell with Dignity (www.dwellwithdignity.org) and other local organizations. My work can be found at The Cove in McKinney, and on Facebook and Instagram as LesleeOrtegaArt. Come along on my journey...! The company takes my original art and makes gift items from it. They have the equipment necessary to turn my art into a finished gift item.